The concept of America as a representative democracy has worked relatively well for over 2 centuries, and it is ultimately superior to other forms of government that are oppressive and despotic; Americans can thank the Founding Fathers for protecting this country from becoming an authoritarian dictatorship. It is difficult to imagine many Americans agreeing to abandon democracy for another form of government, but there are a frightening number of citizens who hate America’s representative democracy with such passion that they are leaning heavily toward overthrowing the government and installing a fascist dictatorship. The group in question is not an extremist militia organization and they are not concealing their plans from plain view, and in fact, have begun the transition to fascism from within the conservative movement with full cooperation and assistance from establishment Republicans in Congress and state legislatures around the nation. The idea that America’s democratic form of government could fall to an authoritarian regime began taking shape shortly after the election of Barack Obama, and after a little over four years of constant propaganda by Republican politicians incensed that their reign came to an end in 2009, almost half of Republicans believe “an armed revolution might be necessary to protect our liberties.” A recent poll reveals that it is worse than it seems because more Republicans believe armed revolution might be necessary to overthrow the legally elected government than believe is not required, and GOP politicians have been hard at work inciting their base and putting the brakes on democracy since January 2009. On Tuesday, a Fairleigh Dickinson University poll revealed that despotism is rampant among the Republican rank and file who are following the lead of Republicans in Congress who have taken extraordinary steps to bring America’s democracy to a halt through not-so-devious machinations and with stunning impunity. In the Senate, for example, the inordinate use of the filibuster has given minority Republicans control of the upper legislative chamber, and around the nation Republican-controlled states are taking extraordinary steps to bring an end to free and fair elections for non-Republican voters. 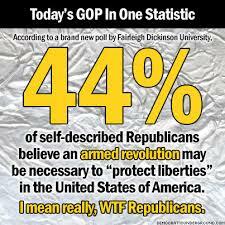 If Americans are foolish enough to believe the Republican’s use of armed revolution to install a permanent Republican government is predicated on the right to unrestricted firearm possession, democracy is already doomed and all that is left is ceding control of the government to the Koch brothers and their fascist regime.